Part 1. Carbon cycle in the ocean. 1. Long-term trend of the partial pressure of CO2 in surface waters and sea-air CO2 flux in the equatorial Pacific (H.Y. Inoue et al). 2. G.lobal change and oceanic primary productivity: effects of ocean-atmosphere-biological feedbacks (A.J. Miller et al). 3. Comparison in seasonal variations of primary production measured by 13C spiked incubations around Japan (K. Yokouchi et al). 4. Depth and tme resolved primary productivity model examined for optical properties of water (I. Asanuma). 5. Settling particles in the central North Pacific (H. Kawahata). 6. Understanding biogeochemical processes in the Pacific Ocean on the basis of labile components of settling particles (L.P. Gupta, H. Kawahata). Part 2. Marine carbon cycle in response to climatic change. 7. Monsoonal impacts on the biological pump in the northern indian ocean as discerend from sediment trap experiments (T. Rixen, V. Ittekkot). 8. Variability of the Indonesian throughflow: A review and model-to-data comparison (A. Shiller, S. Wijffels, J. Sprintall). 9. Coral records of the 1990s in the tropical northwest Pacific: ENSO, mass coral bleaching, and global warming (A. Suzuki et al). 10. Recent advances in coral biomineralization with implications for paleo-climatology: a brief overview. (T. Watabane et al). 11. Potential feedback mechanism between phytoplankton and upper ocean circulation through oceanic radiative transfer process induced by phytroplabnkton-- numerical ocean general circulation models and an analytocal solutions (S. Nakamoto et al). 12. Precession and ENSO-like variability in the Equatorial Indo-pacific Ocean (L. Beaufort). Part 3. Terrestrial carbon cycle. 13. Methods of estimating plant productivity and CO2 flux in agro-ecosystems – liking measurements, process models and remotely sensed information (Y. Inoue, A. Olioso). 14. Absorption of photosynthetically active radiation, dry-matter production, and light-use efficiency of terrestrial vegetation: A global model simulation (A. Ito, T. Oikawa. 15. Terrestrial net primary production (NPP) estimation using NOAA satellite imagery: Inter-annual changes between 1982 and 1999 (Y. Awaya, E. Kodani, D. Zhuang). 16. Global mapping of net primary production (H. Shimoda, Y. Awaya, I. Asanuma). Part 4. Process studies on terrestrial carbon cycle. 17. Slash-and-burn agriculture in a Japanese cedar (Cryptomeria japonica D. Don.) plantation: Effects of fire on nutrients and soil emissions of carbon dioxide (T. Ohtsuka et al). 18. Leaf and shoot ecophysiological properties and their role in photosynthetic carbon gain of cool–temperate deciduous forest trees (H. Muraoka, H. Koizumi). 19. Seasonal variations in CH4 uptake and CO2 emission by a Japanese temperate deciduous forest soil (Y. Oe, S. Mariko). To understand the global warming mechanism, global mapping of primary production was carried out under the GCMAPS program. The program was concerned with marine and terrestrial environmental changes, which affect carbon cycle on the regional and global scales. On the regional scale, warm phase of ENSO (El Niño / Southern Oscillation) has been shown to affect economic activities in many countries. The keyword for understanding mechanism of global warming is ‘primary productivity’. The earth observation satellites (EOS) like the ADEOS of Japan, and the SeaWiFS, Sea Star and Terra of the U.S.A. provided much required data for modeling and verification of primary production estimates on both land and ocean. The knowledge gained during the GCMAPS program has been documented in this book. Interpretation of the data suggests that global warming, which causes temperature and sea level rise, and changes in climate and ecosystems, is likely to have the largest influence on mankind. The first half of this book discuss changes in marine environments. Physical and chemical oceanographic properties of the equatorial Pacific and Indian Oceans are presented. Changes in partial pressure of carbon dioxide, flux and composition of settling particles and biological communities in the surface ocean have also been discussed. In addition to this, over hundred years of environmental records based upon coral skeletons are presented. Estimations of primary production and its utilization in validating satellite imagery data were conducted in the western North Pacific. Primary productivity estimates based upon the validated satellite imagery are presented on the global scale. Climate change modeling of primary production in global oceans is also presented. The latter half of this book deals with changes in terrestrial environments. Primary productivity estimates for different types of ecosystems (e.g., forest, grassland) are presented together with soil carbon dynamics. Also, biomass and productivity estimation and environmental monitoring based upon remote sensing techniques are presented with a model analysis of the relationship between climate perturbations and carbon budget anomalies in global terrestrial ecosystems. 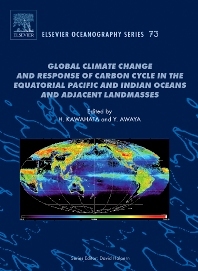 This book elucidates integrated aspects of the global carbon cycle involving marine and terrestrial environments.